ABSTRACT DIGITAL ARTWORK. I had mixed feelings about this image, but in the end thought it was too unusual to discard. Most images I make using "ribbons" aren't this complicated. It looks a bit like a clown and a bit like a child dressing itself for the first time. When I saw it, I thought first of the talking flowers that are so very unhelpful in "Through the Looking Glass," and subsequently of a very cool science fiction I read years ago in Omni Science magazine called "And Also Much Cattle." A bit of research reveals that it was written by Connie Willis. It's a riff on the Jonah story from the Bible; but most specifically on one of my favorite of all stories, the story of Jonah and the gourd. In the sci-fi version the gourd is a talking flower that befriends him. He gets quite attached to the talking flower, while steadfastly refusing to follow orders by going to the city of 9-V to bring civilization (I guess) and water to the wild, repulsive violent men who live there (all of whom are dying for lack of water). When the flower dies of thirst, he is furious and heartbroken, at least till he remembers that the people in the city and all their talking flowers and plants are also dying. In the Bible story, I like it because God asks Jonah after the gourd dies, "Do you well to be so angry?" and Jonah says, "I do well to be angry, even unto death." Jonah is the only Old Testament story I really like, principally because he's constantly resisting God, and constantly getting yanked around by him every time he tries to run away. He doesn't like God at all, you can tell. I wish I could read that story again. I loved that talking flower. This one might be a bit tacky---but the flower in the story due to thirst had a sort of southern accent---but it does look brave and hopeful. I felt I had to include it here. ABSTRACT DIGITAL ARTWORK. A fiery red stylized "lily" made from embossed leather. The central image is an intense scarlet; the little of the background that can be seen----the image occupies most of the field and only part of the five petals can be seen. 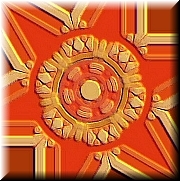 The center is a circle with a raised khai colored details, surrounded by a rim of plae saddle brown, surrounded by a (flat) "fringe" in shades of ivory or khaki. The outer "petals" are defined by strips of ivory and cantaloupe-colored "ribbons." Assertive! DIGITAL ARTWORK. A sunflower image, sculpted in gold. DIGITAL FLOWER. Shiny metallic blue and silver petals, fuschia-pink rings; a yellow and gold center with some rather odd effects. A very detailed sculpted sunflower with gold petals, green leaves, a metallic green setting, and a cobalt blue star (surrounded by a rought purple ring) in the center. Metallic or satiny effects. DIGITAL FLOWER. A bronze and silver flower in a bronze and silver frame. Purple and White Paper Flower. DIGITAL ABSTRACT ART. A purple and white paper flower. DIGITAL LILIES. White and yellow narcissus blossoms on a background of orange fire lilies. DIGITAL FLOWERS. Stylized flowers made of deep blue-green stones. The petals are encircled by a silver, black, and green "bracelet." The flower is set in silver on a black background. ABSTRACT DIGITAL ART. A silver sculpted flower; lacy effect. Silver with pink details.